Allbuild Construction undertakes steel building construction projects around Grand Junction, CO., including full bespoke design and fabrication of steel framed factory buildings as well as prefabricated metal structures for industrial and commercial uses. As leader in this field, in the state of Colorado, Allbuild Construction spares no efforts to maintain that position. Allbuild Construction expertise is vast and covers everything from budgetary assessment to the engineering design of the structure and the complete envelope of the building. Our enduring mission is to build a space where you can work on yours. We take pride knowing we’re not just erecting buildings; we’re making dreams come true. Our steel building construction cost less to design and construct, it’s as simple as that. Up to thirty percent less than other types of construction. And because every steel building is really a building system, labor costs and time of construction are both significantly reduced. Steel building construction has become popular not only in the commercial and industrial sector; steel buildings are nowadays being used in the community for building houses as well. The versatility of steel gives architects the freedom to achieve their most ambitious visions. Structural steel is an essential component of most stadium, shopping centers and commercial developments; steel cladding systems, landmark structures worldwide. Steel is the most preferred metal for the construction of large structures such as bridges, single story industrial buildings and residential buildings. There are three main types of steel construction – conventional steel fabrication, bolted steel structure construction and light gauge steel structure construction. Steel is a versatile building material, which has led to its inclusion in nearly every stage of the construction process from framing and floor joists, to roofing materials. Steel is one of the most sustainable construction materials. Its strength and durability coupled with its ability to be recycled, again and again, without ever losing quality make it truly compatible with long term sustainable development. The biggest benefit to a steel building is the cost compared to traditional construction methods like wood framed timber buildings. Nonetheless, steel building constructions enjoy a greater strength and durability. Combine this with steel’s ability to be recycled and you will obtain the perfect recipe for sustainable development, a thing that is greatly sought after nowadays. A steel building is the ultimate long term solution to your building needs, and will cost less over the building’s lifetime, when weighed side-by-side with a pole barn or timber-framed building. Furthermore, if a steel building needs to be reconfigured or adapted in any way, demolition is not necessary. As the name suggests structural steel is designed to be used to form the structure of construction. It’s strong, durable, and flexible and as such can be morphed into just about any shape. Structural steel shapes are developed from steel that is formed out of a precise cross-section. At the same time, it also follows definite standards for chemical composition and mechanical properties. These include I-beams, T-bars, angle beams, open joists, plates, and much more. In fact if you take a look closely any steel construction, you won’t have to look far to find a piece of structural steel. Structural steel is ductile, strong, durable, and it can be morphed into almost any shape based on the construction; it can be constructed almost immediately the moment it is received at the construction site. More commonly known as reinforcing steel, this type of steel is used as a tension device for reinforced concrete or reinforced masonry structure. Rebar steel is made from carbon steel and it is commonly used as a tensioning device to reinforce concrete and other masonry structures to help hold the concrete in a compressed state. Although created out of carbon steel, it’s designed with specific ridges that allow it to anchor to the concrete as it beds in, giving the whole structure greater support. It’s available in a variety of grades ranging from thin wiring to solid bars all of which are better suited to serve a particular job. Reinforcing steel provides durability, resistance, and stiffness that spreads through a wide area that the other types of steel are not usually equipped in. Mild steel is also known as plain carbon steel. It is another type of steel used in steel building constructions. Due to the strength that carbon steel provides, it is hugely useful in buildings and has proved to be of great advantage. It does not crack when bent, it is immensely flexible, and it is ductile and has great plasticity, along with the fact that it can endure calamities like earthquakes without it causing cracks in the steel. It has a plasticity like no other metal or construction material has. As well as being light, mild steel is incredibly strong, so it can withstand many natural forces such as high winds. This type of steel has two yield points. Low carbon steel is simpler to handle because of its ability of being handled by two yield points, wherein the first yield point goes a little higher over the second, lower yield point. A civil contractor can erect a steel building very fast, due to the fact that the components of steel are predictable and accurate. This is the preferred material for building in urban areas because it reduces the disruption to the surrounding buildings to a minimum. In many inner city projects, it is also important to reduce disruption to nearby buildings and roads. Short construction periods leads to savings in site preliminaries, earlier return on investment and reduced interest charges. This speeds up construction time significantly, making it possible to complete large-scale projects in a matter of weeks. Steel structure residential systems use lightweight materials composed of high-strength fire/ waterproof insulation and sound insulation energy-saving composite wall replaces the traditional clay brick and other heavy masonry materials. When it comes to framing, however, the design of a steel I-beam will almost always cause it to be lighter than the lightest, structurally sound wood beam design. A steel I-beam weighs less than glulam’s, LVL, and parallel beams. The components required for steel constructions are fabricated off-site. At the project’s site, they are assembled by skilled workers only. 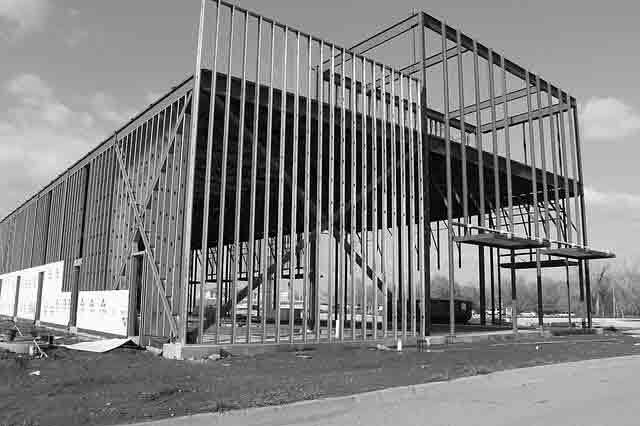 Steel building construction is a safe option since there are no health hazards of using steel structures in construction. Architects and designers like steel’s ability to let their artistic imaginations run wild while still having the ability to design and construct a building that is both safe and resilient. Steel buildings are available with adjustable panels thus you can change the size of each unit as per individual requirements.